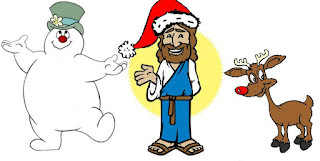 Isn't it funny how we sing songs like "O Holy Night" and "God Rest Ye Merry Gentlemen" with the same basic emotion and sentiment as we sing "Frosty the Snowman" and "Here comes Santa Clause." I mean, how can we sing a line like "Peace on earth and mercy mild, God and sinners reconciled" (from "Hark! the Herald Angels Sing" ((lyrics by Charles Wesley and music by Fe­lix Men­dels­sohn)) and then sing "Rudolf the Red Nosed Reindeer had a very shiny nose..." as though they're basically about the same thing? We've just always sang them hand in hand, in the same season, and if we haven't stopped to think about it we generally don't see much of a difference. What happens is that the true power of the Advent Hymns gets lost in the silliness of the cute carols. It's not that singing Rudolf is bad or dancing to the Twelve Days of Christmas is somehow heretical, it's just that we've lost the depth of worship, excitement and anticipation that is written into those great hymns. We've lost our sense of wonder and hope that something new is being born into reality and we've traded all that for the warm fuzzies of jingle bells and holiday pies. I always try to look to the very first "Christmas Carol" to revive my sense of anticipation. Mary, the mother of Jesus, sang a song after the annunciation. Her song is a beautiful example of the excitement and the anticipation of the reality of Christ's advent. To Mary, the coming of Christ is so real within her that she sings as though it is a present reality (and in one important sense, she was right). She looked with such anticipation that something new was happening--"He has brought down rulers from their thrones but has lifted up the humble. He has filled the hungry with good things but has sent the rich away empty." Everything is being turned upside down so that those on the under-side of society might find themselves restored to dignity and health. This Jesus fellow is coming to turn the tables on everything, including the Temple, and this reality is happening inside of her. How much hope and how much beauty and how much reality is behind those words! Is there such hope, wonder, anticipation, and even reality behind our words when we sing "O Come, O Come Immanuel and ransom captive Israel"? Or have we lost these elements of our celebration to lesser things? Let us sing our Christmas songs in true worship and adoration, with true excitement and anticipation as the reality of the Word of God being born into this world in born within us. in holiness and righteousness before him all our days."